Home » General Health » Stroke Prevention: Entirely in Your Hands? Stroke Prevention: Entirely in Your Hands? So, I do have some seemingly morbid statistics to give you as a bit of a wake-up call…but, before I do, I’d first like to reveal to you one thing: preventing a stroke is almost entirely in your hands. How so? Before we get to that, let’s first get real with the risks. Did you know that strokes kill almost 130,000 Americans every year? That’s one out of every 20 deaths. If you live in the U.S., the truth is that you’ll have a higher risk of getting a stroke.The average American lifestyle, combined with the standard “American Diet,” is enough to make strokes one of the leading causes of death in this nation.But not every stroke kills: 795,000 Americans suffer from strokes every year and 610,000 of those are first-time strokes.And here’s the good news: up to 80% of strokes are preventable. That means that the decisions you make on a daily basis can lower your risk of having a stroke. May is National Stroke Awareness month, so let’s take a moment to go over the dangers of a stroke, and how you can limit your chances of having one. What you eat plays a big role in your risk of having a stroke, so try your best to make healthy eating decisions over the next month (and going forward, of course). Limiting soda, refined grains, added sugars and processed foods can help improve blood flow by lowering dangerous forms of LDL cholesterol. Replacing these items with plant-based foods like vegetables, beans, whole grains, nuts, and fruits can improve your cholesterol profile and greatly reduce your risk of having a stroke. Swapping fatty red meat for fish can also be extremely beneficial!Another benefit of cleaning up your diet is the potential for dropping some of that extra weight you’ve been carrying around. Excess weight puts increased strain on your circulatory system, which is a major stroke risk factor; as are high cholesterol, high blood pressure and diabetes—all issues that are closely tied to diet and weight. 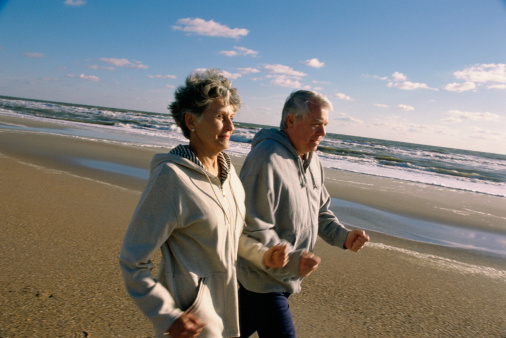 As you might have guessed, physical activity is a major way to reduce your risk of a stroke. People who exercise five or more times per week are less likely to have a stroke. Opt for 150 minutes of moderate, steady-state activity each week (i.e. walking or jogging at a continuous, consistent pace). If you would like to do something a little more intense, 75 minutes of vigorous cardio per week should suffice. Resistance training is also recommended, so including that as part of your exercise regime twice per week can be beneficial. Use a blood pressure monitor to keep tabs on your blood pressure and cholesterol levels; this will help you assess your progress. If your blood pressure is 140/90 mm Hg or higher, you’re at increased risk for having a stroke. Many grocery stores have blood pressure monitors—or you can even download an app on your phone for free! Cholesterol testing is best done by a doctor, so book an appointment with your physician to run some tests. Remember that how you live every day could either increase or decrease your risk of suffering a debilitating stroke—so start living a healthier lifestyle today. “Lifestyle Risk Factors,” National Stroke Association Risk Factors, http://www.stroke.org/understand-stroke/preventing-stroke/lifestyle-risk-factors, last accessed May 7, 2015. “Stroke Facts,” CDC web site, March 24, 2015; http://www.cdc.gov/stroke/facts.htm.